Have you ever wanted to make the code coverage, compiler warnings or some other build stat more visible? Well, now you can! The status of the External Build Jobs is displayed correctly (#265, #266) - thanks @hschink! Even though the anonymous analytics were not gathered if you opted out, the script was still loaded causing an unnecessary HTTP request. This is no longer the case. (#276) - thanks @larsrh! Instead of displaying the description of a failure set by the Build Failure Analyzer, Build Monitor now display its name making the information much more concise #275 - thanks @patrickdepinguin! The above steps are documented in the acceptance tests, together with the accompanying screenshots. The cool thing about the Groovy Postbuild plugin is that it has access to quite a lot of your build data via Jenkins core APIs, which you can see in their examples. You might be aware that I've been busy working on Serenity/JS, a next generation acceptance and regression testing library. If you're working with modern web apps and have "learn some new tools" on your list of New Year's Resolutions or you're interested in doing acceptance testing at scale, please check out serenity-js.org and let me know what your think! aborted builds are no longer rendered as failing (#260, #264) - thanks @deiga! oh, and Build Monitor also supports IE's Compatibility View (#259) - thanks @GMZwinge! 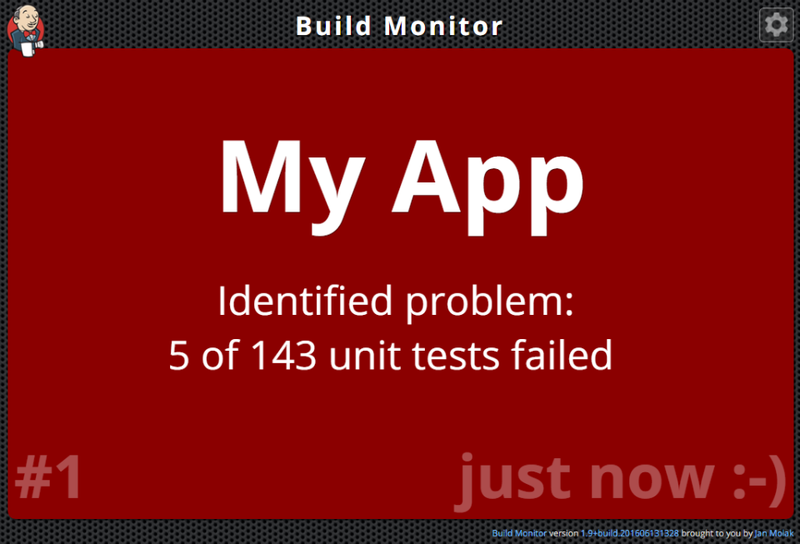 With this release, Build Monitor will tell you quite a few new things about your builds! ... or not! Because displaying people's names is now optional, so if you prefer Build Monitor to be a bit more discreet and keep this knowledge to itself, untick the "Display committers" option in the Build Monitor view settings (#243, #203). Having said that, please remember that claiming a broken build also hides the names of possible culprits! It is also a great way to show that someone is actively working on addressing the failure. You've also asked for the Build Monitor to support HTML content set using the Build Description Setter Plugin, such as links. Good news, you can do this now too! (#238, #222). By the way, to prevent any XSS vulnerabilities, only regular, safe HTML works. OK, so now onto the accessibility features! - The amount of animation Build Monitor uses can be reduced to make the screen a bit easier on your eyes when there are multiple jobs in progress. 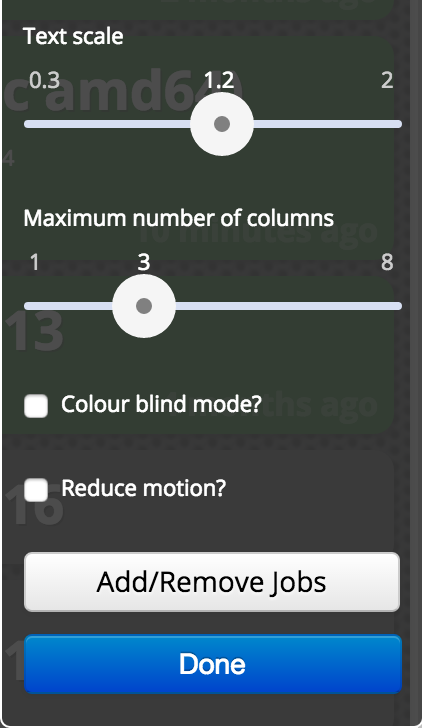 You can enable this feature by ticking **"Reduce Motion"** in the settings (#184) - You've probably also noticed the new slider component? I've replaced the old one in favour of [rzSlider](https://github.com/angular-slider/angularjs-slider) as it **supports click events** and it's much easier to use on smart TVs (#217) - A bug that caused the state of "Colour blind mode" setting check box to be reflected incorrectly when the browser was reloaded got squashed now too. a JobView model is now a composite of different features that a job might have. This should make adding support for pipelines and folders a lot easier. Phew, that was quite a bundle! Please upgrade your Build Monitor as soon as you can, give this project a ★ if you find it useful and feel free to ping me on Twitter @JanMolak if you have any questions or feedback! I've been getting plenty of positive feedback and quite a few questions after my talks on the Screenplay Pattern and scalable BDD. This release brings support to some of the new features of the Build Failure Analyzer Plugin, closing #148, #170 and #228. In short, you can now provide your fellow devs with more detail when the reason of a build failure is found. Of course, displaying the number of failed tests is just one example usage! Will you use this feature for any other purpose? Let me know! I'm looking forward to hearing your thoughts on the latest changes, and don't forget to 👍 the ideas and suggestions you'd like to see implemented next! Oh, and one more thing! I'm planning to write an article on how the Screenplay Pattern and Serenity BDD are used on Build Monitor. If you don't want to miss it, follow me on Twitter and Medium!